I wish I had been recording when I plugged the ceiling fan…but I wasn’t. They were more curious than anything. In fact that has been one of the more interesting things about watching these two. Without a ‘mom’ who says, “Get back, get behind me, or stay away!” these guys really don’t startle much. I think this will change a bit more in the future when they are out in the full herd (but that remains to be seen months from now). The other thing they were introduced to was ice cubes. The goal was to keep the milk replacer cool for longer. Victoria from Last Chance gave me the instructions. Thankfully for me, and the foals, the weather has been almost ideal from the time I brought them home; 70’s during the day and 50-60 at night. Except that 20 degree jump the other day to 95! I know that many other places get (and stay) hotter than this…my issue was the sudden impact. Talk about hot babies! 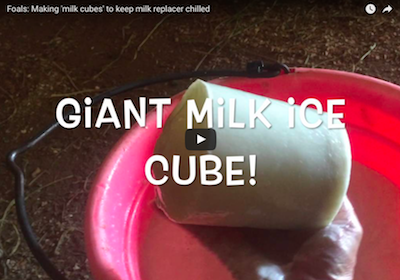 Here is a short video of the milk ice cube, and Justice investigating it.